The most wanted gold head piece from Nicole Richie's collection House of Harlow 1960 is now available online. This is the most popular piece from Nicole Richie's collection ..
and you can purchase it here for $440. 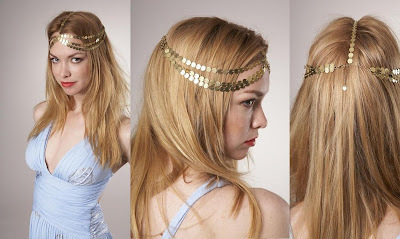 Will you be buying the seven-strand coin headpiece from the House of Harlow 1960 collection?! Charlotte Ronson has just informed me by Twitter ..
"cjronson@NRichienews @nicolerichie i own that headband, its one of my faves. I sell lots of "House of Harlow "at my shop @shopronson." Click here to find out where you can shop at Charlotte Ronson stores!